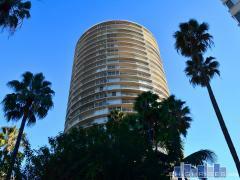 International Tower is a landmark mid-century modern high-rise condo building in Long Beach, CA. The Tower features views from the Hollywood Hills all the way to Newport Beach. Enjoy the luxury amenities including 24-hour doorman, gym and pool. Have any comments or questions about International Tower? Ask your question and/or share your thoughts about this Building.